This weekend we welcomed a new addition to our mustard family. Some of you might be wondering how we can accept any more members into our family. Each one brings something to our lives, sometimes it is as simple as a little spice, maybe some sweetness, maybe a little French attitude but we relish each member of our family. This week's French Fridays with Dorie was a simple recipe for Mustard Batons. I took my visiting brother in law to Rustlin Rob's in Fredericksburg, TX. Rustlin Rob's is a condiment heaven. I knew that I was making mustard batons for an appetizer for Easter so I visited the mustard section. Maybe that was a mistake. How many mustards are too many mustards? When I tasted the Creole Cognac mustard I knew that she had to come home with us. The tangy, delightful flavor would be perfect for an appetizer. I unfolded some thawed puffed pastry and rolled it out to the required size. Mustard was spread on half of the pastry, it was folded, cut into one inch strips and brushed with a beaten egg. I grew up outside of Philadephia, we used to go downtown to ride the escalators and eat hot pretzels. When I hear mustard and bread, I can only think of topping it with flaky salt. We had mussels steamed in wine, shallots, parsley, bay, pepper and a little butter. We dunked bread in the broth and enjoyed ourselves. For April's Daring Cooks; Challenge we had a creative challenge. Renata of Testado, Provado & Aprovado! was our Daring Cooks’ April 2011 hostess. Renata challenged us to think “outside the plate” and create our own edible containers! 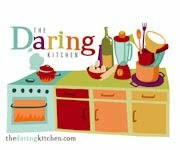 Prizes are being awarded to the most creative edible container and filling, so vote on your favorite from April 17th to May 16th at http://thedaringkitchen.com! I love chili rellenos, but try to stay away from batter fried food. I decided to stuff roasted, peeled poblanos. First, I asked my husband to bring home the straightest poblanos that he could find. Then, I roasted them and peeled away the blackened skin. I made a small slit in them to remove the seeds. After they were peeled, they looked pretty dark. I roasted some chicken and made a tomato sauce with garlic, tomatoes, onions, cinnamon and cilantro. I mixed up some mexican cheese, the chicken, some black beans, a little jalepeno, corn, some of the tomato sauce and cilantro and stuffed the peppers. They were delicious and I am looking forward to seeing what else I can stuff in them! My husband walked into the kitchen and glanced at my opened copy of Dorie Greenspan's around my french table and then he said "you're not an éclair maker are you?" Does the man know me or what. When I saw this Friday's selection for French Fridays with Dorie, I almost skipped it. I know the people in this house and they aren't eating éclairs. But then I thought, I can take them to work. They eat anything at work. Someone is always hungry. This week's recipe calls for vanilla éclairs, cream puff dough filled with vanilla pastry cream and topped with white glaze. To get the people in this house to try them, I knew that I needed to add some chocolate, so I decided to top them with a ganache. I made the pastry cream early in the morning and put it in the refrigerator to cool. I like making puff dough. We eat gougeres on Christmas Eve. However, they don't involve a pastry bag. They can easily be spooned onto a cookie sheet. Eclairs need a pastry bag, I have previously been identified as not an éclair maker and I am comfortable with that label. I am not comfortable with pastry bags. How do you get the sticky puff dough into the bag without making a mess? Perhaps it is a skill thing, one that I may not develop at this stage in my life. I think a third hand would come in handy. I got the dough into the bag, made the four inch strips and baked them. I went out to work on the yard and let the elairs cool. We had such a long, hard freeze, we have lost some plants. By my front door, I have two bicolored iris plants. They are perhaps my favorite plant. They bloom and bloom. Unfortunately, a lot of the plant had to be cut back after the freeze. But today, there is one flower. When I had finished with mulch, I returned to the eclairs. The cooled eclairs were cut and filled with pastry cream and then topped with chocolate ganache. They were tasty, it was a fun experience. This Friday's challenge for French Fridays with Dorie was a simple, delicious way to prepare some broccoli. I steamed some stalks, sauteed some minced garlic in butter. After the garlic was softened, I added breadcrumbs and then some chopped parsley. The stalks had been drained and patted dry and were coated with the breadcrumbs. Here is were I failed, by coating didn't coat. Some of it got on, but most ended up sprinkled on the final dish. I am a coating failure. It was tasty. A bit like broccoli scampi. I like my broccoli cooked in olive oil, garlic and red peppers. I'm not looking for a new method for one of my favorite veggies. Maybe we are stuck in a rut, but I'm ok with that. My mother thinks that I don't make dessert often enough. I've been known to bake dessert for birthdays, Easter and Thanksgiving. That leaves over 345 days undesserted. I pull an occasional dessert out of the hat, but for the most part we are dessertless. I bought Rose Levy Beranbaum's Rose's heavenly cakes because I couldn't resist the pictures. I should have started with The Cake Bible but some of the desserts in this cookbook called out to me. I made a bundt cake a while back. I do enjoy a good bundt cake. I remember having some difficulties getting the cake out in one piece. Rose has a beautiful yellow daisy cake in her cookbook. She bakes it in a Nordic Ware daisy cake pan. It is a beautiful pan cake pan that leaves daisies on the top of the cake, for say $35 dollars. I am at the point in my life where I am trying to downsize the number of things in my kitchen. I can't see spending the money for a spring time cake pan when Rose says that a fluted tube pan can be used instead. Perhaps I should mention that many of the things in the kitchen that I am trying to downsize are over 25 years old. The fluted tube pan, which I will refer to as bundt pan, has seen better days. But remembering my recent difficulties, I was certain to well prepare the pan. To no avail. The top of the cake remained in the pan. The bottom almost did as well, but I stuck a knife in and saved the day. Good news, I was planning on dividing the cake and filling it with berries and cream. It self divided. But it was no easy feat releasing the top; it came out in chunks. Which I then covered with more cream. I threw the pan out. I'm not a big fan of throwing things out. But my darling husband asked me what chemicals are being released by 25 year old nonstick pans that are way past their prime. I have ordered a new pan. The cake was delicious, ugly but delicious. Here is a link to Rose's blog with a yellow cake recipe.